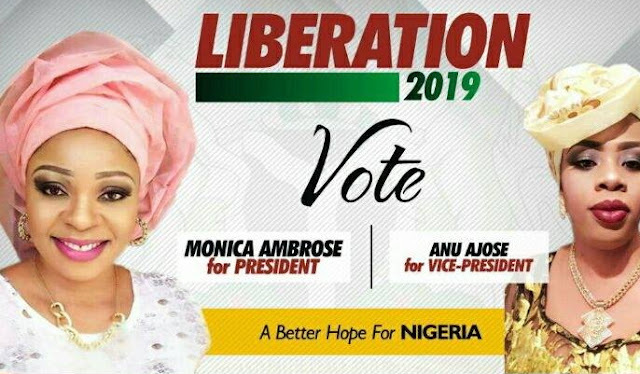 A Dutch Nigerian who earlier in the week disclosed her intention to run for Presidency in 2019 has released her official campaign posters. 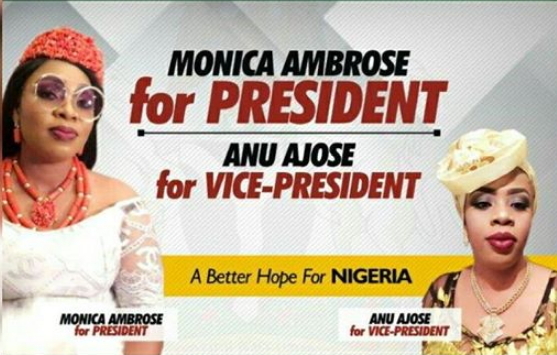 Monica Ambrose who has since released the name of her running mate slammed haters mocking her bad English. 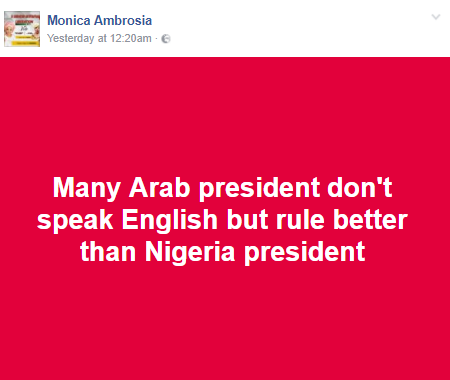 The mother of three who has lived in the Netherlands for 15 years told Nigerians not to worry about her bad English since most Presidents in Arab countries don’t speak English. 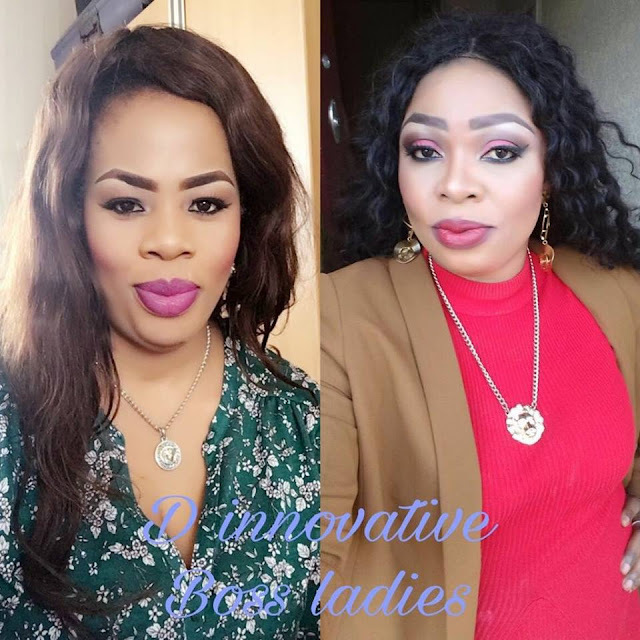 Check out full photo of Monica and her business partner and running mate, Anu Ajose below. Is she for real?? Let’s hope this is not another publicity stunt. Is Nigeria really ready for a female President?? Anything is better than what we have now in Nigeria. Our mumu don do. Her English is even better than that of our president and most of our politicians. My people our mumu don do. Lol I guess it movie sha. Nigeria is in trouble. so bad even retired prostitute want to run as president shame on that country..
LET SEE UR FACE WITHOUT THE MAKEUP PLS TO KNOW WHO WE ARE VOTING FOR. ONCE YOU ARE NOT A NIGERIAN U CAN’T BE OUR PRESIDENT MADAM TRY WHERE YOU ARE. HAVE SEEN ASEWO IN ITALY WHERE YOU CAME FROM MA. YOU ARE EX ASEWO NOT FIT FOR THE HIGHEST OFFICE IN NIGERIA….. HOLLAND LEGALISE ASEWO NOT IN NIGERIA YET. WELL, WE HAVE TO TAKE WHAT IS AVAILABLE. THE MEN THAT CLAIM TO BE GOOD ARE NOT EVEN BETTER. 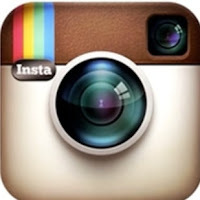 LET US TRY THE RETIRED PROSTITUTE, SHE HAS TRAVELLED THE JOURNEY OF HELL AND CAN COMPARE BETWEEN HELL AND EDEN. MAY BE THE RETIRED PROSTITUTE CAN HELP NIGERIA OUT. BUT, I WANT TO ASK IF SHE HAD MADE ENOUGH MONEY TO BIBE HER WAY. GUESS WHAT ! I AM NOT GOING TO SUPPORT YOU WITH MY OWN KOBO. GOOD LUCK IN A DREAM THAT CAN NEVER COME TO REALITY ! God bless your funny souls.You guys make us bend over with [email protected], @Brave Hunter, and @MADAM ERANKO are yet to comment and we are already laughing so hard. She has a good ambition but not prepared for it. For her boldness, I did appreciate, she needs to out, research and plan properly. 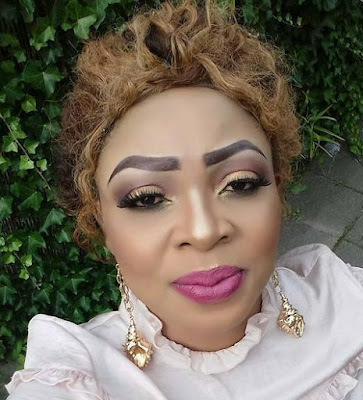 This once’s go finish our remaining money with their make up…..oooooooooooh.